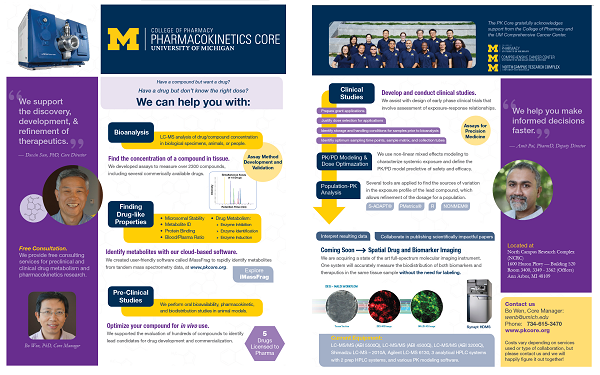 The Pharmacokinetics (PK) Core aims to facilitate researchers' efforts to discover new medicines, obtain research funding, file patent applications, and publish academic research findings for both preclinical and clinical pharmacokinetic applications, including lead compound modeling, dose optimization, and clinical trials. 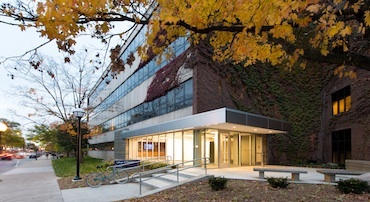 The PK Core at the University of Michigan was established in 2009 to provide services for both preclinical and clinical researchers. In the core's short history, we have studied the preclinical PK and drug metabolism of more than 2000 compounds and have been involved in 18 human clinical PK studies. We have contributed to more than 100 grant applications, which resulted in over $43 million in funding to the University of Michigan. We have provided services to more than 70 U-M labs, and 20 external labs. Our work has resulted in over 30 joint manuscripts, with five patents issued and six pending. 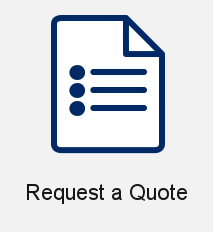 We can work with you either by joining your grant proposals as collaborators, for which we provide consultation as well as PK services, or fee-for-service via recharge. Please contact the PK Core manager, Dr. Bo Wen, if you are interested in working with us. The PK Core is supported by the College of Pharmacy, the Comprehensive Cancer Center, and the Center for Discovery of New Medicines.